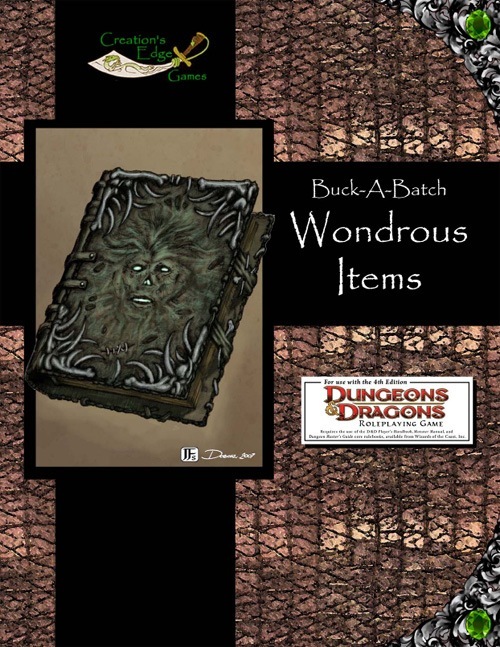 Buck-A-Batch: Wondrous Items for 4th Edition Dungeons & Dragons features 25 unique magic items for your fantasy campaign. The items are presented in two formats for your convenience: standard book format and a card format for cutting out and handing to your players. All Buck-A-Batch products are formatted to be "three-ring binder friendly," allowing you to build your own gaming supplement at a fraction of the cost of store-bought books. Sign in to start a discussion about Buck-A-Batch: Wondrous Items (4E) PDF!